COUNTING loop - the traditional style. The loop increments (or decrements) a number between an initial and a final limit of an interval. It is said to count the executed passes through the loop. Consequently, you have to specify a counter variable as well as its initial and final value. By default the counter variable is automatically incremented by one after each execution of the loop body. You may specify a different increment (step value), which might be negative but it must be a non-zero integer constant if you want your loop to be executable or sensibly exported to a programming language of your choice. All these parameters form the control phrase, separated by configurable keywords. The underlined keywords (or key string sequences) disambiguating and separating the parameters of the loop are configurable in the Parser Preferences. 2. Now either select the FOR loop symbol in the toolbar (see red box in the image above - note that the FOR loop symbol may have different appearence, depending on whether or not the DIN representation is chosen) or open the context menu, choose the "Add" submenu, then either "Before" or "After", and eventually select the respective FOR loop entry. Alternatively, you may press the <F7> or <Shift><F7> key (see Keybindings). 3. When the editor pops up, you will see the following form. The screenshot shows it prepared for specifying a counting loop (upper radio button selected). The labels and default field contents are influenced by both Parser Preferences and Structure Preferences (we will discuss his later). Now you have several ways to set up your loop. b) If you select the lower one of the two radio buttons (labelled "foreach" here), you will be presented the form for a traversing loop instead (see screenshot below). Again, you will have to specify the name of the loop variable but then a list of values, preferably comma-separated and within curly braces. But it might also be the name of an array variable or just a space-separated enumeration of some values. The listed values are not required to be numbers, not even literals. As before, the editor will immediately compose and present the control phrase. c) By selecting the "Full Text Editing" checkbox, however, the editor-internal synchronisation changes direction, i.e. now the text area (marked by a green box in the image below) will be enabled whereas the radio buttons and the form fields in the upper region simply show the conclusions Structorizer derives from parsing the control phrase you are writing. The parsing success depends on the keywords configured in Parser Preferences for counting (FOR) and traversing (FOR-IN) loops. The structured text fields in the upper region will immediately be synchronised whenever you touch the text. Be aware that the form fields may show some strange things while your control phrase is incomplete, incongruent, or ambiguous. d) As soon as the entered text rather resembles the control phrase of a traversing loop (i.e. a FOR-IN loop), the radio buttons will switch and the upper part of the editor will change its appearance, i.e. the set of form fields including the labels will alter as the next screenshot demonstrates. Synchronisation between the upper text fields and the larger text area starts as soon as you click into one of the active fields or toggle the "Full Text Editing" checkbox. 4. Fill in some helpful description in the comment area if you like - this will be the loop comment, obviously. Then commit the data by clicking the "OK" button or pressing key combination <Shift><Enter>. 5. Add instructions to the body of your loop. Therefore first select the empty element and then select an arbitrary type of element to insert it. The Executor will reject any attempt to manipulate the loop variable within the loop body as illegal interference with the loop control mechanism (from version 3.25-10 on; before it just hadn't an impact on the loop control). Also see Analyser Preferences. The image below explains where the different labels and settings come from. 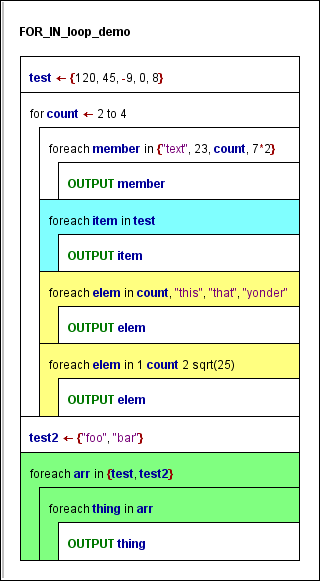 The keywords and strings in the green boxes (also the "foreach" label) are fed from the Parser Preferences and control the detection of the FOR loop parameters within the control phrase (loop header). So they may look different with other settings! The blue-boxed text in the full text area is the default text configured in the Structure Preferences. This will already have been filled in here when you add a new FOR loop and it decides which set of form fields is presented. If your default control phrase is that of a traversing loop then the lower radio button with its corresponding form fields will be active on opening the editor. If your default phrase cannot not be classified (because it is neither compatible with the parser preferences of a counting loop nor with those of a traversing loop) then the result is undefined and the form fields are likely to show some strange tokens. The editor has a non-editable field where it may display some message if you happen to enter e.g. a non-integral value (or an expression) for the increment in full text mode, or if it detects some syntactically defective value list in case of a traversing loop. See the screenshots below for an example. The conversion above is not reversible, i.e. the editor won't bother to find out whether a value sequence is a continuously enumerable integer interval. Actually, in most cases such a conversion would not be possible. If you edit an existing FOR loop then the editor will automatically detect the style of your loop and present the parameters in the form fields. If the editor opens with "Full Text Editing" mode being active, however, then some discrepancy among the stored control phrase and a phrase generically composed from the contents of the form fields was detected. In the diagram below you see a counting loop and several traversing loops (configured with keyword foreach here), even nested ones (green). As you may see, in addition to array variables and array initialisation lists, mere item enumerations (separated by comma or even blanks) are also accepted (yellow loops). Obviously, a list consisting by design of a single element, as in e.g. doesn't make much sense since no loop would be required to apply the loop body (not shown here) just once to this only value. foreach c in "This string will be split"
some_variable itself might be meant to be the first and only element of a one-element list, such that elem would be assigned the entire object some_variable is containing, even if it happens to be an array. reading 2 doesn't justify the use of a loop (see above). Hence, the virtual ambiguity is simply overcome as follows: a single variable keeping the place of the value list is required to be an array variable and will be handled this way. If there are two or more variables, in contrast, then they will be treated as elements, i.e. as if they were enclosed in braces (like in the outer one of the green loops). Hint: You may decompose a counting FOR loop into an equivalent sequence of an initialisation instruction and a WHILE loop, simply by means of the transmutation wand .